Three youths under the watch of the state’s Department of Children and Families died of overdoses last year, and six others suffered nonfatal overdoses — the most since state officials declared the opioid epidemic a public health emergency five years ago. The nine cases, disclosed in a recent state report, have set off alarms among child welfare advocates. While it’s unclear if it’s a grim new trend or a tragic anomaly, the advocates said the overdoses underline how much the drug crisis is still buffeting DCF, the agency charged with helping protect children from abuse and neglect. The three who died ranged from 16 to 22 years old, according to the report released by the Office of the Child Advocate. Two of the five near-fatal overdoses involved children under the age of 5 who had come in contact with unspecified “substances” in their home. And one other overdose occurred in so-called congregate care, which includes group homes or other residential settings. The nine who overdosed in fiscal year 2018 were in the custody of DCF, receiving services from the agency, or had been involved with DCF in the preceding six months. The specific circumstances around the overdoses, including the deaths, were not detailed in the report, and state officials declined to release other information, citing confidentiality laws. But the incidents represent a clear increase. 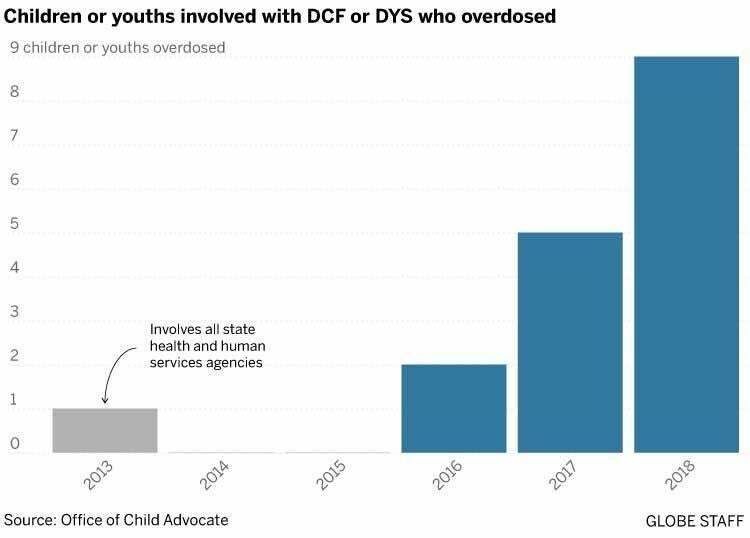 In the previous four years, officials identified a total of four overdoses in DCF’s population, none of which were fatal, according to the Office of the Child Advocate, which tracks deaths, near-fatalities, and serious injuries among those involved with state agencies. Maria Z. Mossaides, the head of the Office of the Child Advocate, said that without going through each case, she didn’t know how many involved fentanyl, the powerful synthetic that was present in nearly 90 percent of fatal overdoses statewide last year. But the uptick is something her office is “closely monitoring” and pinpointed as a concern among the 46,000 children DCF serves. DCF officials cautioned that it’s common in child welfare for data to vary from year to year, but Elissa Snook, a DCF spokeswoman, said the agency would use the Office of the Child Advocate’s report to help “inform” its efforts. She also touted other moves DCF has made to address the opioid crisis, including holding its first agency-wide forum on opioids last year, when approximately 200 DCF managers and social workers heard from physicians and substance abuse experts. It’s also doubled its number of substance abuse counselors, from five to 10, since 2015. “While we remain encouraged by the decreasing trend in opioid-related deaths, the Office of the Child Advocate’s report shows that the epidemic continues to present a very serious challenge for everyone, including the Commonwealth’s most vulnerable children,” Snook said. To be sure, the nine overdoses represent just a sliver of DCF’s total population. They’re also only a fraction of the 62 deaths and near-fatalities reported by DCF in fiscal year 2018, with one — the overdose in congregate care — not even classifying as near-fatal or a serious injury. Thirty of the deaths were caused by medication complications or Sudden Unexpected Infant Death. But overdoses were among the most common causes of death among DCF-involved youths between 16 and 22 years, tying with suicide, medical conditions, and gunshot wounds. They were also the most common type of near-fatal, or life-threatening, incident across all age groups at DCF, even more so than accidents. Even though fatal overdoses have begun to recede slightly in recent years, the opioid crisis has only intensified since officials dubbed it an emergency in March 2014, with nearly 2,000 people dying last year alone. Because of this, substance use among parents remains a driving force behind children entering DCF care. But that also can point to another problem, McGeown said: Those who witness drug use or are living with parents struggling with addiction are also more likely to later use and become addicted to substances themselves. “If we know we’re seeing more parents using it and losing custody of their children, then we should expect those children are at greater risk of developing a similar disorder,” McGeown said. Tammy Mello, executive director of the Children’s League of Massachusetts, said finding similarities in the cases, including what drugs were involved, is important to explaining the increase. The Office of the Child Advocate didn’t detail any fatal overdoses among state-involved children or youths in reports from the previous four fiscal years and there was just one noted in fiscal year 2013, when a 20-year-old accidentally overdosed. In that span, the office also reported seven near-fatal overdoses — five in 2017, including two DCF-involved kids between 12 and 15 years old, and two in 2016, both of which were DCF-involved children under the age of 3 who accidentally took unprescribed medication. The three others from 2017 were youths involved with the Department of Youth Services who attempted suicide, according to the Office of the Child Advocate. DCF has long felt the brunt of the opioid crisis, which has helped drive more children into state custody. In fiscal year 2017, reports of babies born with opioids in their systems had already jumped 11 percent in a two-year span, reaching 2,675 cases, according to DCF figures. All opioid-related overdoses in the state, while still at staggering levels, have dipped slightly for two straight years, including among those under the age of 25, falling from 143 in 2015 to 85 last year. That the numbers at DCF spiked now is surprising, but it also could point to the challenge of providing such care to a vulnerable population, said Dr. Sharon Levy, director of the Adolescent Substance Use & Addiction Program at Boston Children’s Hospital.